It’s May again, every year I leave my wife and kids to their grandparents home at Nainital, and I get a month of bachelor life. So, every year this time I plan to do few things, like visiting those places that my wife hate most 😉 , learn something new, do some technical stuff, and put up new posts/articles on my blogs. But on the same side I miss them very much, without them house feels like biting you from every corner. So me and my office friends (5 of us, I, Aditya, Anubhav, Prakhar and Swaraj) decide to do a trip to Bidar district, which is in Karnataka state, and is around ~120 kms form Hyderabad. Bidar is famous for its 500 years old sprawling Bidar fort and many other architectural and historic monuments (mentioned below in our plan), like Tombs and many religious places of Islamic, Hindu & Sikh culture. Friends were planning to travel by bike, but I insisted on going by car. As it’s been a long time I didn’t even do a 5 kms on bike, and I know how painful it is to sit on a bike as a pillion rider for a long journey. Here in India bike means motorcycle, not bicycle 🙂 . So we decided to go on a weekend (14th May, Saturday), and planned to start early in the morning by 4:00 am, so that we reach Bidar on time and visit most of the places, and go back to Hyderabad by evening the same day. Checked google map and according to it we have to take Mumbai highway (NH 64) from Miyapur till Zaheerabad (~80 kms), then take right exit at TS Border check post, towards Bidar on (SH 14) via Tumkunta, Kothur and Metalkunta for next ~30 kms (map below). On Friday evening and by night we chalked out the whole plan on what all places we need to visit in and around Bidar and sent WhatsApp message to all. Couldn’t make at 4:00 am but got a call from friends at around 6:00 am that they are going to start and will reach my place by 6:20 am. So I woke up, had bath and got ready. They all were on their bikes, on asking if we can go by car they convinced me to go on their bike, so I just agreed, and we left by 7:00 am. Sat as a pillion rider with Prakhar on his bullet, with other two bikes, Aditya on his KTM and Anubhav & Swaraj on their CBZ. Just after around ~10 kms felt too much uneasiness while sitting. So asked all to stop at short intervals for breaks, but after riding again the discomfort was not going away. So we all thought this way we would not reach Bidar on time, so decided to forget all pains and have a continuous ride for next 40-50 kms. The Mumbai highway (NH 64) was not in good health and at several stretches road widening work was going on. So we could not maintain a good average speed. As we reached Zaheerabad, we decide to take break and have something for breakfast as there were 2-3 dhabas/restaurants, at the TS Border check post. So we entered one Punjabi dhaba, checked the menu and ordered Alu-Paratha, Sabji-Poori and Upma. The Alu-Paratha was very tasty and beyond our expectations, so if you are passing by or visiting this dhaba, so stop by and try this out. After taking right exit from the Mumbai highway and running for around ~12 kms near Metalkunta village we saw a big white mausoleum besides the road (pics below). It looked so vibrant and white-shining we just stopped by to check it. It was a mosque and dargah, the dome and minarets were casted by white-marble, there were also few people with families inside. There was a board near by mentioning the architecture as “Astana Chishtiya, Hazrat Multani Baba, Gangwar Shareef, Taluk Zaheerabad, Dist. Medak, Telengana State”. After checking this place and taking some pics we moved ahead, Bidar town was still ~18 kms from here. There were two railway crossings and we had to wait for around ~15 mins on the second one. Due to not so good roads we took around ~4 hrs to reach Bidar, thus crossing just ~118 km stretch was really tiring, the time was 11:00 am. While entering Bidar city we were surprised to see that as a remote city it is well maintained, clean, with broad roads. Our phones were not getting GPS signals so we ended up visiting the Fort first. The parking was just near to the Fort main gate (from the place where I’ve taken the first pic below). Purchased some water and cold-drink bottles. The sun was on top our head and it was burning like hell, by this time we all were exhausted. We entered the fort from the first gate, Mandu Darwaza, gate with spikes. The second gate, Kalmadgi Darwaza is just few meters ahead. The gate and fort walls were very thick, so got some relief from sun, and took rest under the second gate for few minutes. Saw many 2 wheeler, cars and autos entering and exiting the fort. On asking weather we can take out bikes inside they told its not allowed. The vehicles going in and out belong to the people and families who lives inside the fort premise, and came to know that there is a small village inside the fort. Thus you can imagine how big is the fort. The sultan Alla-Ud-Din Bahman Shah of the Bahmanid Dynasty shifted his capital from Gulbarga to Bidar in 1427 and built this fort. Later the fortress was rebuilt using red laterite stone around the old fort in 1428 by Ahmed Shah Bahmani. The fort is 1.21 km long and by 0.80 km in breadth. The circumference of the fort walls measures around ~2.5 km. The fort premise includes numerous buildings, arches, pavilions, mosques, gateways and gardens, most of them today in ruined state, and some of them preserved and maintained by the State. After crossing the second gate, the narrow road leads to an open area touching the third gate, Gumbad Darwaza. Between both these gates there is a big deep moat/ditch (above, last pic), which at earlier times might be used as a defense against enemy attack, usually filled with water and crocodiles. After crossing the third gate we entered into an open area, with lush green garden, a big tree and a ruined building on one side, on the other side was a restaurant, and ahead was the Rangin Mahal, Takht Mahal, and Solah Khamba Masjid (16 Tower Mosque) under the same compound. The compound facade has a lush green garden known as Gagan Mahal with water fountains. We entered inside the compound and to our despair both Rangin Mahal, Takht Mahal were closed due to some maintenance work. We checked the Solah Khamba Masjid, took photos, had some rest, and chit-chat over there. It was around 2:00 pm and we were too hungry so we checked the deserted restaurant hoping if we could get something. But to our surprise all things mentioned in the menu were available but would take time for preparation. We ordered some veg and non-veg food, rotis and rice. The food was awesome, we got refreshed and gained some energy to roam more around the fort. We headed to the open area, and everything was under the open sky now. We thought to take a look at Diwan-e-aam/khas, but everything there was ruined, and all buildings were deserted. There was nothing to see, except some couples around the corners 🙂 . We came back towards the third gate after checking the area walking for around a km. Near to the solah khamba masjid and Gagan Mahal, we filled our bottles with drinking water from the RO dispensers. There were lot of ruined and broken statues of animals and god/goddesses were kept. They seemed to be talking about their story and the changes ancient India went through the Mughal rule. At around 4:00 pm we left the Fort and headed towards this temple, which was on a long, winding road down hill. It is a cave temple and associated with lord Narasimha, an incarnation of Hindu god Vishnu. The specialty of this temple is the cave/tunnel that is half filled with water and you have to go through and get the glimpse of the deity’s image formed on the laterite wall. At the other end of the cave you get to see the Lord Narasimha and a Shiva Linga. Again here the cave was closed and we could not go inside. At around 5:00 pm we left to the Gurudwara and reached within 15 minutes. We knew about the Gurudwara, but this big Gurudwara was also a surprise to us. This is the home town of Bhai Sahib Singh, one of the Panj Pyare (five beloved ones), who offered to sacrifice their heads and were later baptised as the first members of the Khalsa. We washed our hands & feet, and entered into the holy shrine, which comprises of Darbar Sahib, Diwan Hall and Langar Hall. Prayed in front of the Sukhaasan room where the holy book Guru Granth Sahib is placed. This Gurudwara is also famous for pure/holy Spring water that is collected into the Amrit Kund for a holy dip. A legend is associated to this spring from the Guru Nanak’s era. There was acute shortage of drinking water and all efforts of digging wells were going in vain. The Guru got moved by seeing this and removed some stones and rubbles from the place with his wooden sandal, and suddenly a water spring sprinkled up, which is still flowing till date. That’s how the Gurudwara name was put up as Nanak Jhira (Jhira means stream of water). Now it was 6:30 pm and time to move back to Hyderabad. 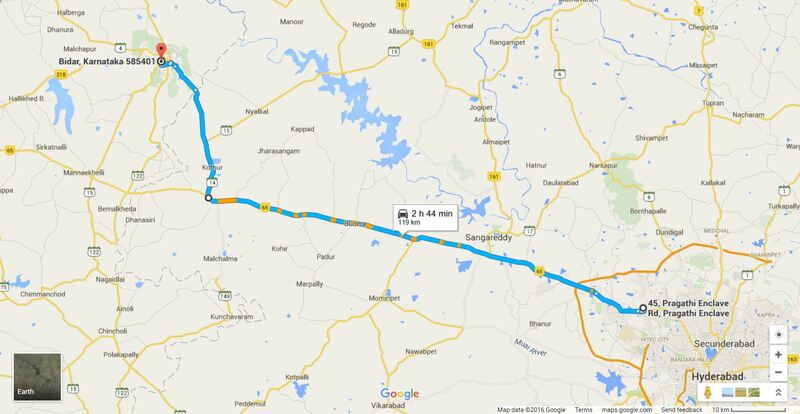 I drove the CBZ bike all the way and took the same route back to HYD. The climate started to change becoming very cloudy and dusty followed by strong winds and rain. We stopped at a road side dhaba, had tea there. And after rain stopped resumed back to out destination home. Reached Hyderabad border by 10:30 pm, but still Hyderabad was far away, and if we did not stop then we won’t get food anywhere in the midnight. So as we saw a decent restaurant we stop by and had dinner. After having dinner reached home by 12:00 pm. – If you are not comfortable riding a bike, or have not driven from long time, try not to be a macho and go by car. – Have two days to visit all places in Bidar and to avoid rush. – Stick with the chronological plan (mentioned at the top) to save time and mileage. ← Process for closing Passport application file at Secunderabad RPO?